EveryDay with Rachael Ray magazine is a magazine for smart entertaining, delicious food and spur of the moment travel. Each issue of EveryDay magazine includes amusing articles and exciting columns, such as 30 Minute Meals, featuring 10 new recipes of the season; Rachael's Diary, featuring snapshots, snippets, lively insight and inspiration; Big Bashes, Small Get Togethers, geared to small party gatherings; Stolen Weekends, including last-minute, fun filled food getaways; and Every Day Menu Planner, a 7-day, tear out shopping and cooking guide. 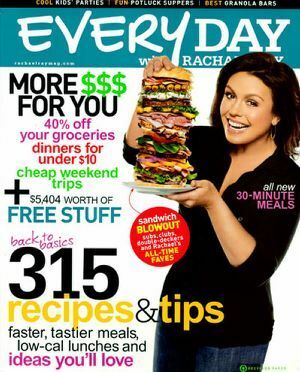 Fans who can't get enough Rachael Ray on TV will love EveryDay with Rachel Ray magazine!